SouthPeak Games' court-seized stock has been auctioned off, but the proceeds barely put a dent in the publisher's monster-sized debt. 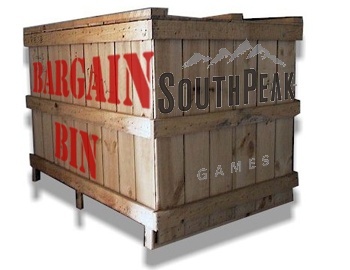 SouthPeak has quickly become an example of how game publishers should not behave. Aside from suing Majesco over the publishing rights to My Baby, the company is involved in two separate disputes over who it owes money to. The more prominent of these two cases has been between SouthPeak and CDV, which has been going on for quite some time and recently resulted in court bailiffs seizing 40,000 copies of SouthPeak's games. The games have subsequently been auctioned off, generating "over Â£50,000" in proceeds. Earlier this year, SouthPeak was ordered by a UK court to pay CDV $3.4 million after the former was sued over unpaid debts. Since then SouthPeak hasn't really made any effort to pay this amount, which CDV says is the reason it's gone into liquidation and been forced to close its UK office. After getting fed up waiting for the payday that would apparently never come, CDV's legal firm Fladgate LLP arranged for bailiffs to seize SouthPeak's games and auction it off. On top of the sale, a Â£30,000 payment from distributor Centresoft to SouthPeak was frozen by the courts and a decision about who that money will go to. While Â£50,000 sounds like a reasonable amount of money, CDV will apparently only get Â£12,000 once all the associated fees are paid off. Southpeak's next release is Two Worlds II, and CDV is debating about how it should proceed with this game. According to Lawrence Abramson, a partner at Fladgate, "The question is, do we seize the stock or let it sell and seize the proceeds? And then there's the question of whether Centresoft would want to distribute Two Worlds II for SouthPeak. It's not their problem of course, but it does unsettle the staff when bailiffs turn up at the door." While SouthPeak's legal problems are its immediate concerns, it's going to have a far more serious problem if it manages to survive all these lawsuits: It looks like a group that no one will want to work with in the future.